The UK, Ireland and Denmark do not have to join any EU quota scheme for housing migrants and evenly distributing refugees, the European Commission has ruled. British Prime Minister David Cameron has invoked a rarely used opt-out to European Union (EU) asylum policy in Britain’s fight against a proposal to evenly distribute refugees across member states. The Commission now seemingly agreed and said the UK and Ireland cannot be compelled to join the EU scheme and the countries can decide on their own whether they want to “opt-in” to a treaty within three months of it being introduced. Denmark, meanwhile, negotiated a blanket “opt-out” clause. “Denmark will not be bound by the rules and laws adopted under the European Agenda on Migration,” the BBC reports. On Wednesday the Commission will announce a “European Agenda on Migration” – policy guidelines to beef up the EU’s laws for handling migrants. So far the relocation scheme – which takes several factors including a country’s demographics into account to create a fair distribution of migrant numbers for each state – is only a proposal, and the majority of EU countries would have to agree for it to become law. France, Germany, Italy and several others support the quota proposal. Brussels's plans to compel EU member states, including Britain, to take in tens of thousands of refugees rescued from the Mediterranean Sea were immediately opposed by the UK Home Office. The Prime Minister’s decision to use an 18-year-old opt-out, dubbed the ‘nuclear option,’ signals the hard line his government will take towards the EU over the next five years. Cameron has touted his election victory as a “mandate” from the public to renegotiate Britain’s relationship with Europe. The UK struggled to mobilize a blocking minority among the EU’s 28 members on Monday, meaning it was likely Britain would lose a vote at a meeting to discuss the mandatory quota system next month. Some 219,000 people arrived in Europe via the Mediterranean Sea last year, 3,500 of whom died or went missing in the process. In the first four months of this year alone, 46,000 Mediterranean migrants arrived in Europe and more than 1,750 died or went missing. Some 800 people died in one day, on Sunday April 19, in one of the worst disasters yet involving migrants being smuggled to Europe. 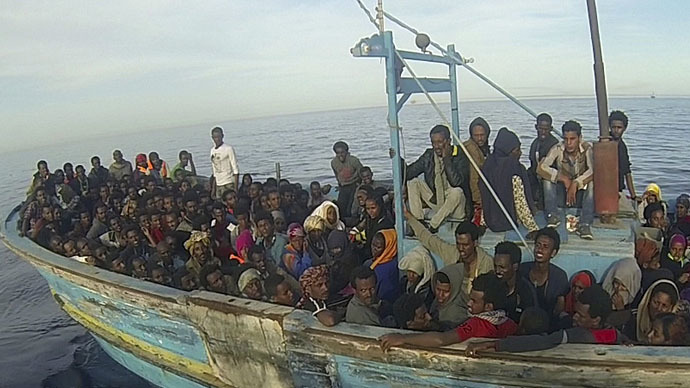 Archbishop of Canterbury Justin Welby, head of the Church of England, called on European countries to “share the burden” of migration following the shipwreck. “We can’t say this is one country’s responsibility, the one nearest, that’s not right,” he told the BBC. “Of course, we have to be aware of the impact of immigration in our own communities, but when people are drowning in the Mediterranean, the need, the misery that has driven them out of their own countries is so extreme, so appalling that Europe as a whole must rise up and seek to do what’s right,” Welby added. Labour, which supports the refugee quota system, has attacked Cameron’s tough stance on receiving migrants. “There is low political support for responsibility sharing of refugees, yet such a policy is critical and urgent for the EU,” said Claude Moraes, a Labour MEP and chairman of the European Parliament’s home affairs committee. Cameron will be emboldened by skeptical attitudes expressed by his European counterparts towards the plan. Similar proposals drawn up in the past by the European Commission were rejected by the British, and a number of EU states have expressed hostility towards the scheme, including the Netherlands, Denmark, Estonia, Slovakia and Hungary. Germany is an outspoken advocate of the scheme, as the country receives the most asylum applications in Europe – 200,000 last year alone. The Mediterranean states of Greece, Italy and Malta are also in favor of refugee sharing. Speaking to the Times, a diplomat said invoking the ‘nuclear option,’ negotiated by former PM Tony Blair in 1997, could lead to the breakdown of Europe’s refugee system over the next year. While Britain has used the opt-out in the past, it is unprecedented for a UK prime minister to announce his decision to invoke it before the EU commission has tabled legislation. Cameron’s gambit is a show of strength from a newly elected Tory government. The prime minister was greeted with cheers when he told Conservative MPs in the House of Commons on Monday that he will fight to “get a better deal” in Europe. He vowed to “renew” Britain’s relationship with Brussels and repeated his promise of a referendum on the country’s EU membership before the end of 2017. Cameron faces a rebellion from up to 60 hardline Euroskeptic MPs in his party if he fails to secure concessions from Europe. With the fervently anti-EU UK Independence Party (UKIP) having won 12.1 percent of the popular vote in the last election, the prime minister will need to appear victorious against Brussels if he is to avoid mass defections from his party.